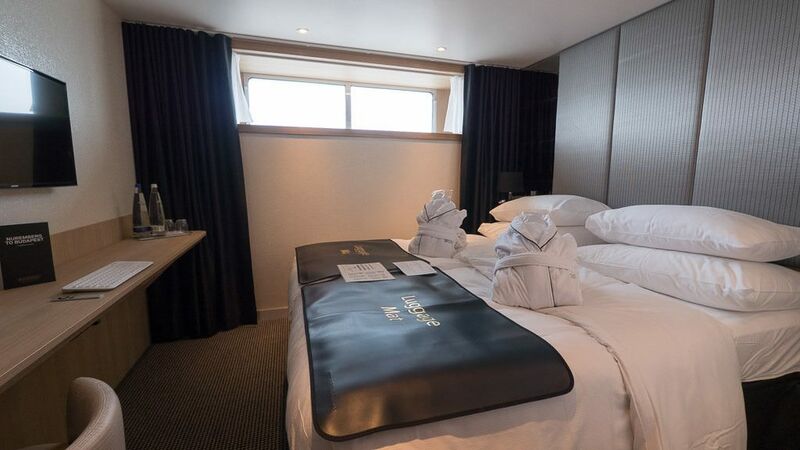 Scenic Jasper features a mix of staterooms and suites, ranging from 160 square feet (15 square meters) to 475 square feet (44 square meters). 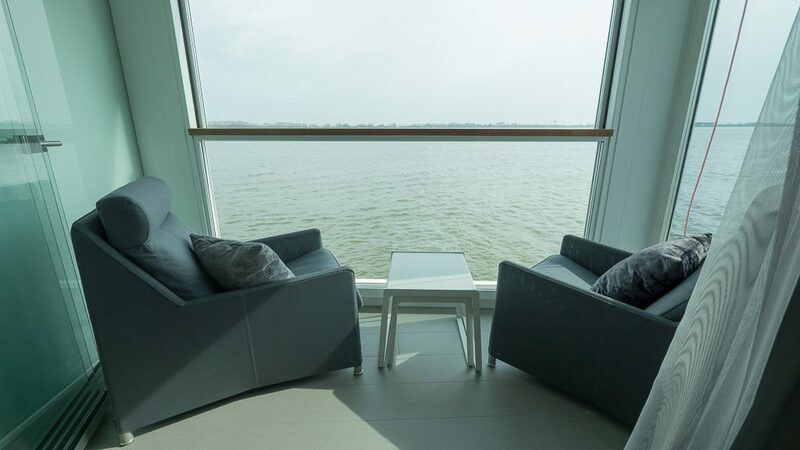 The major distinguishing factor of a Scenic stateroom is the “Sun Lounge,” a mix of open-air balcony/solarium in all but the baker’s dozen of standard staterooms. Uniworld’s S.S. Catherine and the newer S.S. Maria Theresa feature retractable windows, but not with the step-out balcony feature found on Scenic ships. The Royal Suites (there are four on Scenic Jasper) increased in size from 310 square feet to 350 square feet. A new integrated wall separates the bed and living area. 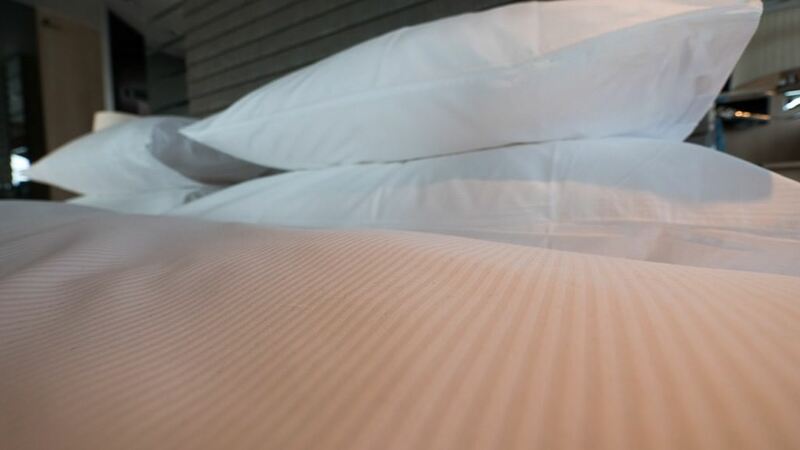 Queen-sized beds feature Vi-Spring bed toppers and luxury linens. 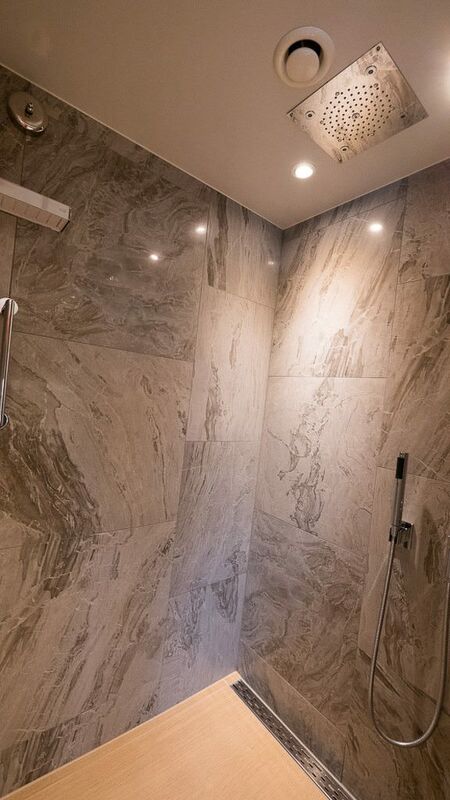 Bathrooms now have heated floors. The two Royal Panorama Suites feature the same upgrades as the Royal Suites, plus luxury designer balcony furniture. 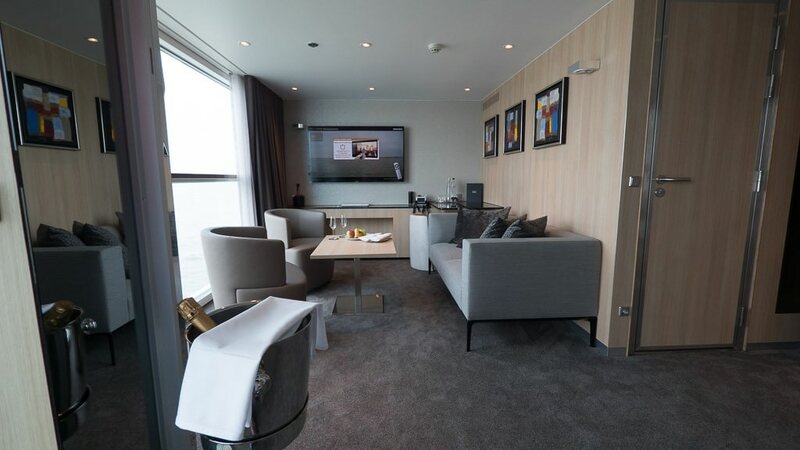 The Royal Suites increased in size from 300 square feet to 475 square feet and are among the largest suites on the rivers in Europe. 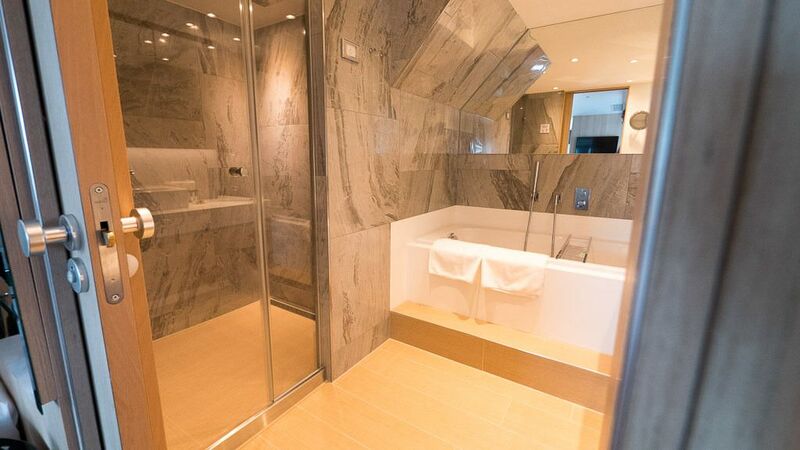 By comparison, Viking River Cruises’ Explorer Suites measure 445 square feet, and Uniworld’s Royal Suites on S.S. Catherine measure 410 square feet. 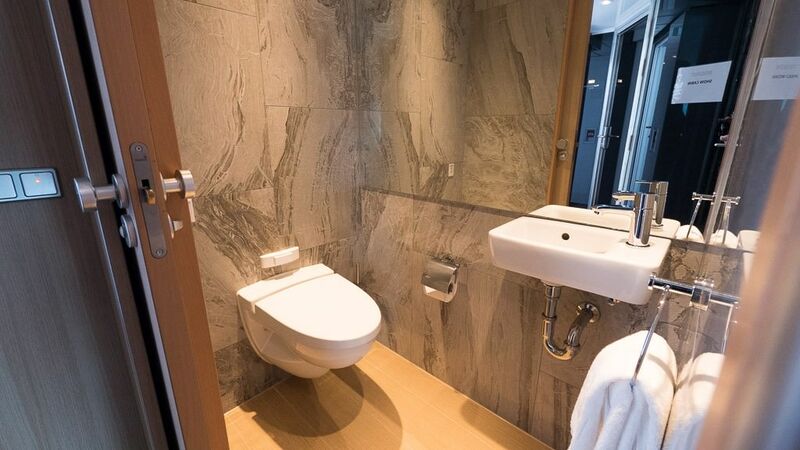 All staterooms feature new bathroom cabinets, new vanity desks and upgraded balcony furniture. Staterooms also saw improved wardrobe enhancements and a new folding glass door on the Sun Lounge. Also new on Scenic Jasper: “Slumber Beds” feature three sleep systems that guests can customize to their preferences in addition to new “ultra comfort feather toppers” and Egyptian linens custom made for exclusively for Scenic by Beaumont & Brown. A new pillow menu offers seven pillow options. Luxury bath towels were made for Scenic by Move. 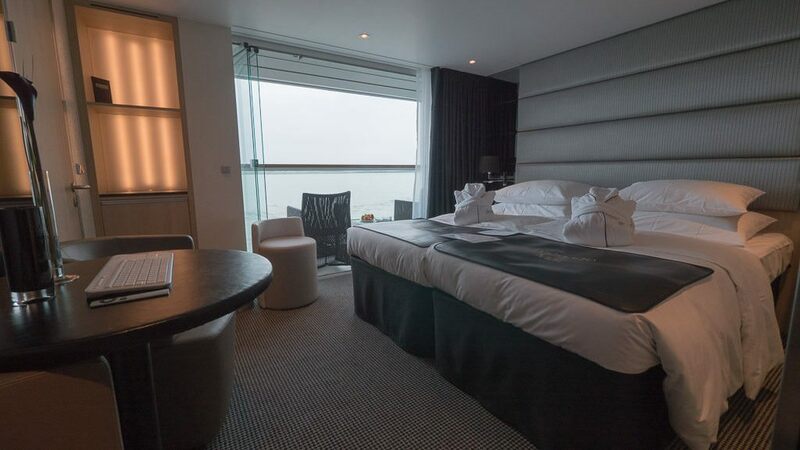 All rooms, except for standard staterooms, feature private balconies with Scenic Sun Lounges. 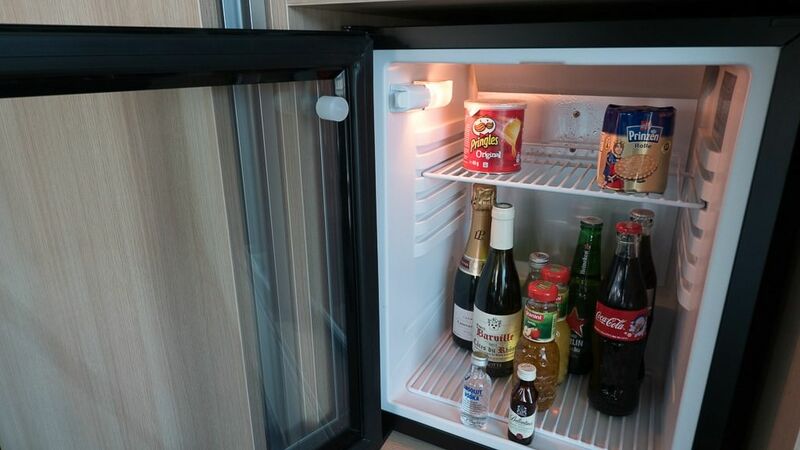 Complimentary mini-bars are restocked daily. WiFi is free of charge and works throughout the vessel. Samsung HDTVs are integrated with Apple technology (Mac Minis) for on-demand movies, internet access and more. Butler service is included for all staterooms and suites, as well as 24-hour room service, a rare feature on river cruisers, and one that I enjoyed for dinner tonight. 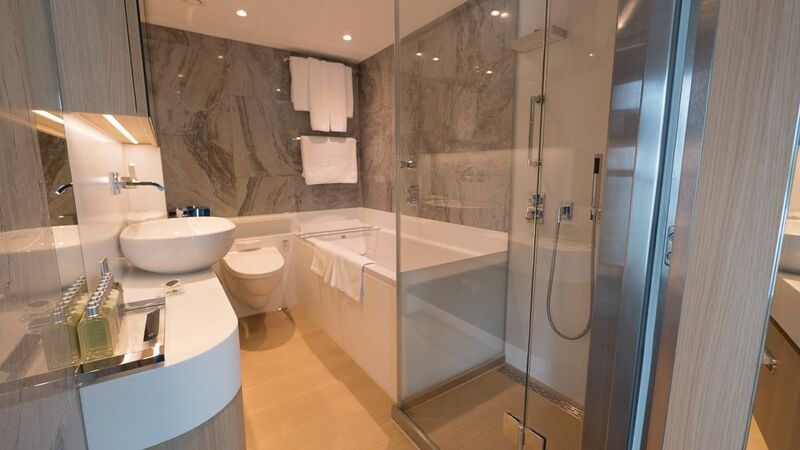 Bathrooms feature showers, L’Occitane bath amenities, hair dryers, bathrobes and slippers. Two huge suites are situated aft on deck 3. 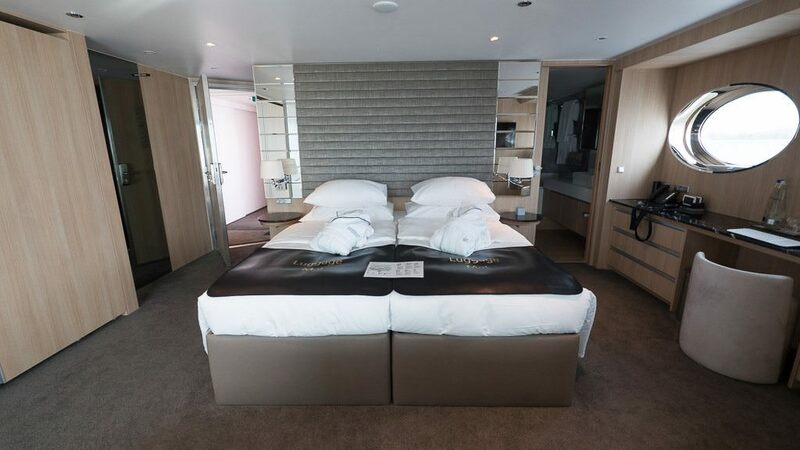 The Royal Panorama Suites (336 port side, 337 starboard) are amazing spaces that measure 475 square feet each (44 square meters). 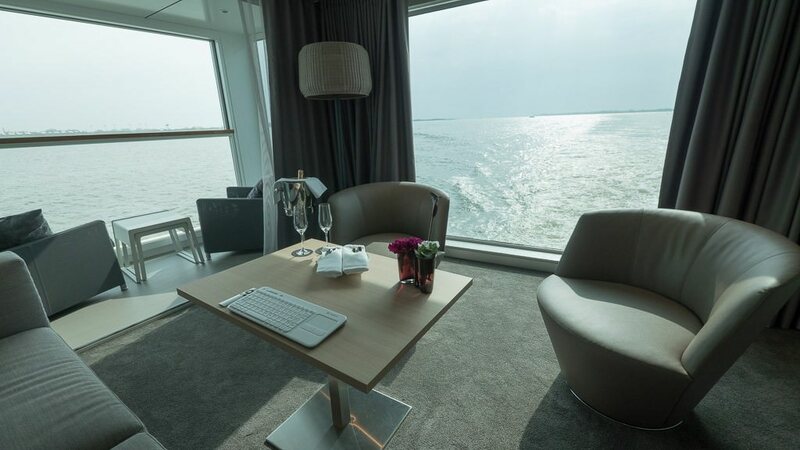 These are the largest pair of suites on contemporary river cruise vessels. The two suites each feature a bedroom, a half bath and a full bath with tub and rainforest shower. 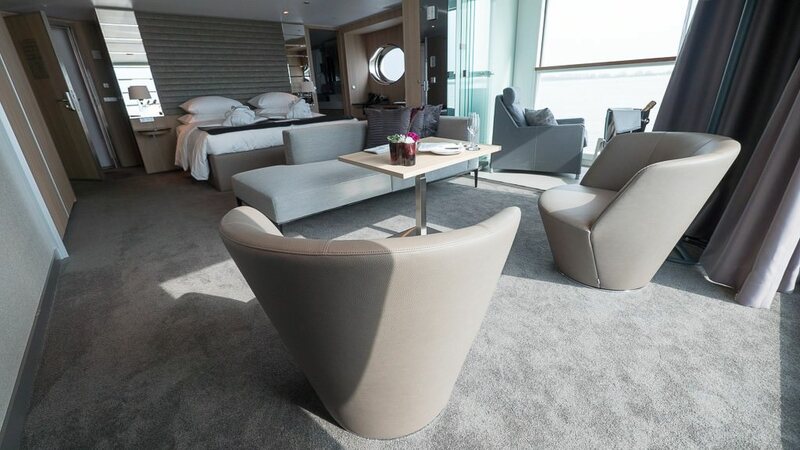 The suites feature living spaces and cozy Sun Lounge nooks set off to one side. 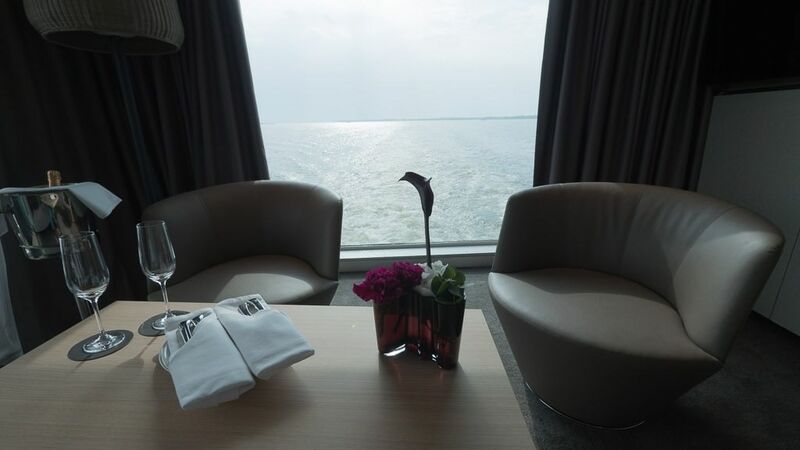 I particularly appreciated watching the river’s wake as Scenic Jasper motored along the Danube today (the suites are open for showings during our sailing). 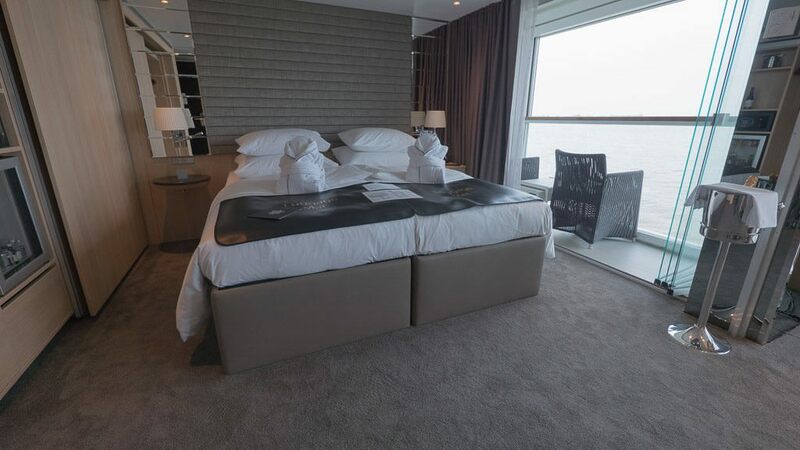 The suites, I learned, were constructed in modular fashion and added to the ship’s superstructure during construction. To minimize vibration that could be caused by the engines, the suites sit on rubber bumpers that act as cushions. The Sun Lounge, which faces aft on other Scenic ships, was moved to the side based on guest feedback. There are four Royal Suites. 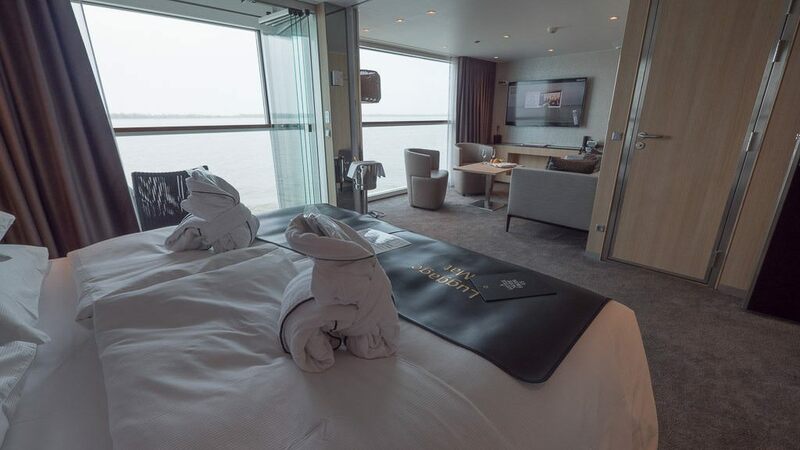 As previously noted, the Royal Suites increased in size from 310 square feet to 350 square feet (when compared to the rest of the Scenic fleet). A new integrated wall separates the bed and living area. 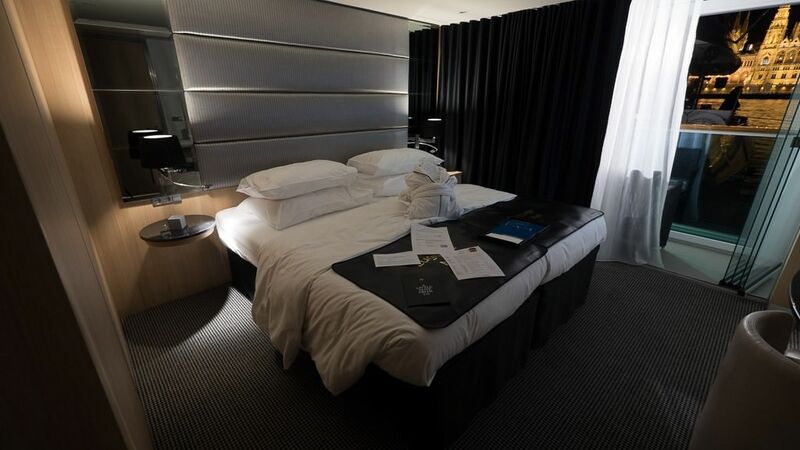 Both the Royal Suite and the Royal Panorama Suite offer €100 per person credit in the Wellness Center along with other perks such as private chauffeur service at Amsterdam, Budapest, Bucharest, Basel and Nuremberg airports. The Junior Balcony Suites measure 240 square feet (22 square meters). The Balcony Suites measure 205 square feet (19 square meters). The Deluxe Balcony Suite (there were none open for showing during my sailing) measures 225 square feet (21 square meters). 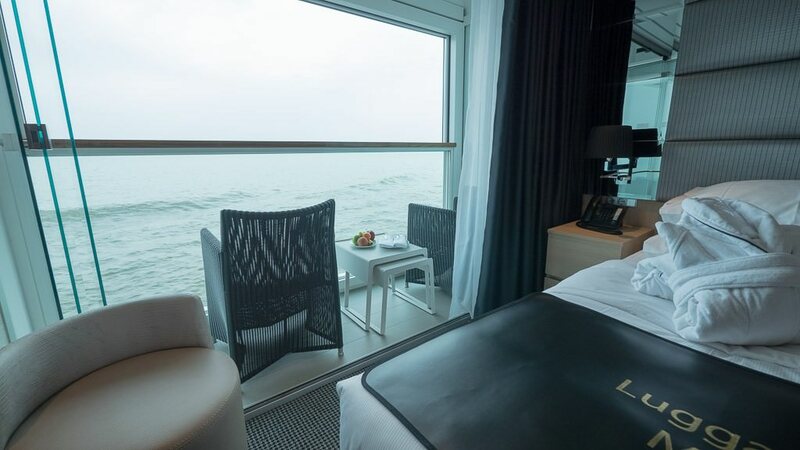 My accommodation for this cruise was in Balcony Suite 231, and I found the room to be enjoyable. There was adequate room for room service. I enjoyed watching on-demand movies on the flat-panel television using a familiar Apple remote and watching the passing of the European landscape from the comfort of my Sun Lounge. 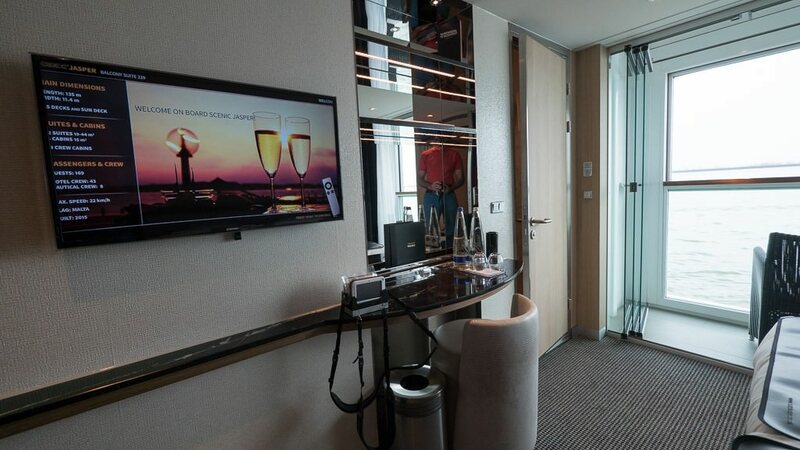 Balcony Suite 224 is for the solo traveler. The odd cabin also bumps the capacity up to 169 guests on Scenic Jasper. Enjoy the same shipwide amenities and services but at a lower price point. 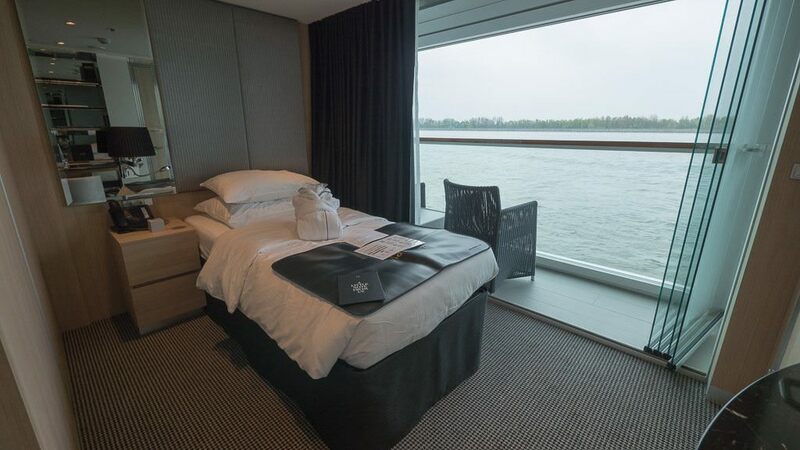 Standard Staterooms measure 160 square feet. Complete the form for special savings or added perks that I may be able to obtain from River Cruise Advisor's travel partners. The ship looks absolutely gorgeous, and is lovelier than we had been led to believe. We have just under 3 months until we head over to Budapest for our much anticipated cruise. Thank you, thank you, thank you…….you have heightened our anticipation to a new level, this is a once in a lifetime trip for us……and we are excited. So big question is how is the food? Being from Texas a Big Meat and Potatoes type of guy. Sorry to be asking so many questions but what sort of camera are you using as I am thinking that I shall need to take my SLR and have a very good Zoom Lens. How has the nightly entertainment been so far? Mr. Grizzle, my hat is off to yo sir for you are doing a Wonderful job of informing folks like ourselves as what life is like and also what to expect to find on your first river cruise. That biking trip looked to be just the ticket for doing something a little different although I do have some years on you. Question as do you peddle most the time or do you use the Electric Assist? Oh are you going to put all of your postings together once said and done..
Mr. Grizzle, you are so very kind as I just looked and you have done a Great job in posting some photos of all the wonderful cabins. Unbelievable!! Great choice on The Royal Panorama Suite as that is our cabin on our sailing on The Opal. Ahh Just can’t wait Loungin” Laughin” and Tasty Libations..